So simple, so genius. On a crazier note, just when you think there is a blog for almost everything, you find out apparently there is. pocketlights.com Crazy. From flash lights to keychain leds to frisbees. But this is my favorite find. 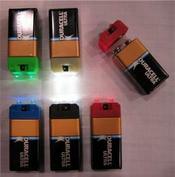 The Pak-Lite LED Flashlight is a small, waterproof and super-efficient flashlight that snaps onto any 9 volt battery. On low power, one battery will run for 600 hours. The Pak-Lite will run for 75 hours on its high brightness setting. It is available with white, green, red or blue LED colors. Case color matches the LED color. The Pak-Lite also comes in a glow-in-the-dark body. The Pak-Lite retails for $23.99. The Glow-in-the-Dark Pak-Lite retails for $26.99.